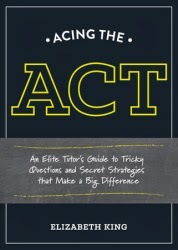 Elizabeth King has written a useful guide for students who strive to improve their test scores: Acing the ACT: An Elite Tutor's Guide to Tricky Questions and Secret Strategies that Make a Big Difference. As the mother of a young man who desires a great test score, we've looked at many available publications and frequently found them lacking. King's guide is very straight forward and well organized, and opens with a statement that most students will immediately relate to: "The purpose of each subsection of the ACT isn't clear to most test takers." I wholeheartedly believe that statement is accurate. It's a distinct disadvantage and that likely provides a wealth of frustration. For that reason alone, I fully appreciate this easily understood book. Section by section, sample question are reviewed and explained with extra attention given to such things as tricky word usage, the high frequency of cross multiplication mistakes, graph labels and identifying your key point in the essay. As parents, I believe we would overlook some of this wisdom King provides. Pointing out the pitfalls for students makes this worth the cost! The true value in Acing the ACT is the clarity of its explanation of each subsection. After identifying the purpose of each, King provides a suggested plan of attack that includes tried and true methods. Additionally, she does a bit of myth busting (there are no patterns to the answers, kids!) and no-nonsense advice about note taking and practice tests. Her "categorization" method of note taking for ACT prep should be required of every student and it exposes the folly of taking practice tests - but not focusing on the reason you miss questions. Smartphones and texting get called out for their role in dumbing-down spelling skills (well put, Ms. King). Last, but certainly not least, this book fits nicely in a purse or back pack, which is so much more useful for study on-the-go when compared to many cumbersome phone book sized guides. Go for quality over quantity. This does the trick nicely. If I knew any high school age kids I'd be on this like a duck on a junebug! This sounds like a great guide! I call 'em as I see 'em. I remember when I took the CPA exam, carrying around a study guide and questions, as well as working through a class on the Internet. Good find! This is one of the only small books I've seen that has any value. I remember the days of studying for the ACT and SAT. I hope he does well! I can't wait till I can say "I remember when..." Last son to graduate next year! Go, class of 2016! Great resource. Where was this when I was a teenager? I have a son getting ready to take it. I may have to get the book. He wants to score higher than his big brother who got a 34. I'm all for competition. The higher the scores, the bigger the scholarship. Cha ching. If you have kids pulling 34s, he may not need this book. I had to look up when the ACT and the SAT were introduced. I probably took one or the other but I don't remember. You can post here any time without submitting your scores for approval. Strange, but I don't currently know any high school students. That's kinda sad. I barely remember taking the ACT. The Hurricane and Favorite Young Man took the SATs. FYM wasn't satisfied with his first score. He came up with a strategy for dealing with math (skip the problems you don't know how to do and come back to them), and he brought his score up more than one hundred points to 1420--not bad. When a perfect score on the SAT was 1600 (yes, I've told this story before and I'll tell it for the rest of my life), The Hurricane got 1590. Her school made all the kids take practice exams and do some other preparatory stuff for the text. I think some aspects of test taking, such as FYM's math strategy, can help, but with the SAT it's mostly what you already know and you can't do much to prepare. I wanted to say something else, but I can't remember it. If I think of it, I shall return. What about your Where's Shady cartoons? I miss them. I remembered. The other students kept asking The Hurricane is she would take the SATs again to try to get a 1600. She said no because 1590 is unique. I like my unique kids. FYM is 35 years old today.